Canadian troops will likely spend several more years leading a NATO battle group. Defence Minister Harjit Singh Sajjan stands with Prime Minister Justin Trudeau as he holds a press conference at NATO headquarters during the NATO Summit in Brussels, Belgium on May 25, 2017. OTTAWA — Prime Minister Justin Trudeau is expected to commit Canada to spend several more years leading a NATO battle group in Latvia — news that will come on the eve of the alliance's annual leaders' summit in Brussels and a likely showdown with U.S. President Donald Trump over military spending. Trudeau was scheduled to arrive in Latvia late Monday, one day before he plans to pay a visit to the approximately 450 Canadian troops who are there leading a multinational force that was first announced in 2016 as a check against Russian aggression in eastern Europe. Canada's current three-year mandate is set to expire on March 31, 2019, but sources tell The Canadian Press that Trudeau is expected to renew the mission during his overseas visit, just prior to attending the two-day NATO summit, which gets underway Wednesday. "We're not here trying to take an aggressive posture. This is about deterrence. 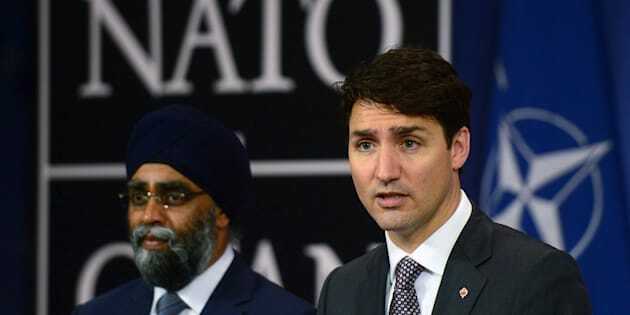 We would like Russia to get back to normality," Sajjan told The Canadian Press in January during a joint interview with Latvian Defence Minister Raimonds Bergmanis. "This will take some time. And Canada is committed for the long term." The prime minister is expected to use the extension as ammunition to fend off attacks from Trump during the NATO summit that Canada is not spending enough on defence. Canada and other countries have faced U.S. pressure to meet the alliance's target of spending two per cent of GDP on defence and 20 per cent of defence budgets on equipment — a target member states agreed to during a NATO summit in Wales in 2014. Trump sent letters to the leaders of several NATO allies in recent weeks, including Canada, expressing "growing frustration" over the fact the targets are still not being met by the majority of alliance nations. The Liberal government has repeatedly argued that has Canada consistently contributed to NATO operations and efforts — as evidenced by its role in Latvia — and committed to grow funding for defence by 70 per cent over the coming decade. But critics have noted that even with the increase, Canadian defence spending will top out at 1.4 per cent of GDP, and it's unclear to what degree extending an existing mission will satisfy Trump's demands for Canada and others to put up more cash. And while Canada's role in the Latvian mission is positive, it is a relatively small one compared to ongoing NATO missions in Afghanistan and Kosovo — two operations that are highlighted in annual reports from NATO secretary general Jans Stoltenberg, said David Perry, a senior defence analyst with the Canadian Global Affairs Institute. "We're doing good things in Latvia, we're one of four countries that are leading the battle groups ... but the two that the secretary general tracks in his report, we have five out of about 18,000 troops." Any extension in Latvia will nonetheless be welcomed by the country's government, which has turned to Canada and NATO for support and reassurance in the face of Russia's recent attempts to flex its muscle and exert its influence across eastern Europe. "This Latvian enhanced forward presence mission altogether in the Baltics and Poland is one of the most successful missions of NATO," said Karlis Eihenbaums, the Latvian ambassador to Canada. "We feel much more stable as a people and also the NATO eastern flank is much more stable. You can ask our neighbouring countries which are not NATO members, like Sweden or Finland, what they think, they are very much for this presence ... they are very happy that Canadians are there." Eihenbaums said security is also a concern when it comes to trade - Latvia has been trying to grow its exports to Canada under the Canada-EU trade agreement. "In order to trade we have to have safety," he said. "We should not stop (the Latvian mission), probably we should go further because we have to think about the air, we have to think about the water, we have to think about the seas."